Let’s take a trip down memory lane shall we? Back to the days when things moved a little more slowly, perhaps around 1959. Slide into a larger vehicle, one built for style, say… an Edsel? Bring the whole family on a motoring adventure and explore Beautiful British Columbia.Take one of our many modern highway systems, each a marvel of 20th century engineering. Outside you will see a seemingly endless variety of scenery. Please don’t spoil the scenery by being a litter bug! Remember to collect your trash and deposit in our Garbage Gobblers along your way. Created in the late 1950s, the Garbage Gobbler is a truly cool piece of transportation history. 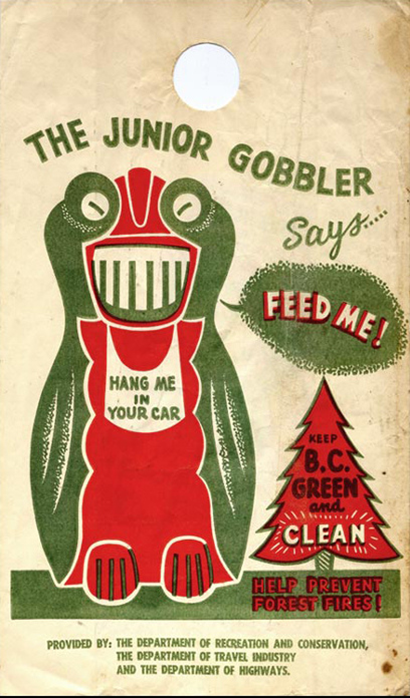 The first Garbage Gobblers were designed and created by Len Shaw, for the B.C. Parks Branch in the 1950s. Originally made from concrete (and later with fiberglass), Gobblers were placed across the province in B.C. Parks and at information points along BC highways in order to “Keep Beautiful British Columbia Green and Clean”. Junior Garbage Gobbler car trash bags were also part of the provincial litter reduction strategy. 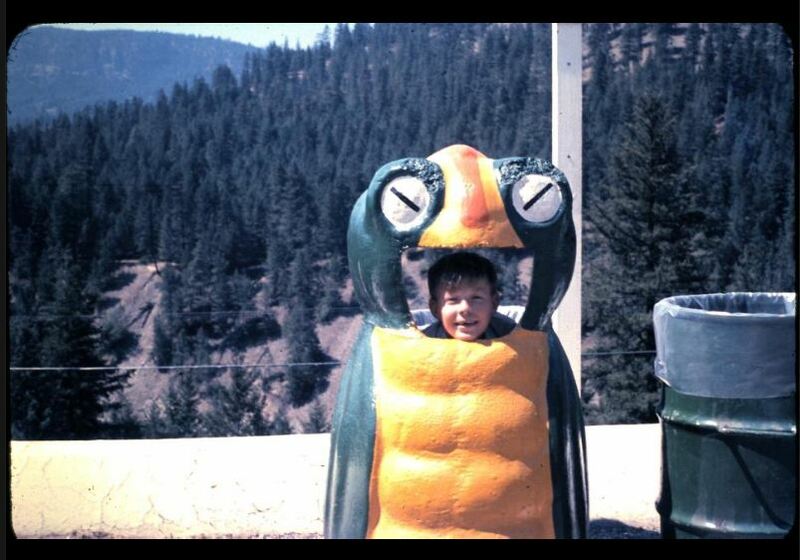 Motorists were encouraged to feed the “Junior” bags to the roadside gobblers along the way. Sadly, Garbage Gobblers proved to be as popular with bears as they were with people and eventually had to be replaced in favour of bear proof-cans (which were not as artsy, but much more practical). We are happy to report that the spirit of Garbage Gobbler lives on! Some gobblers have been preserved, even restored but others have sadly slipped by the wayside. Our research found fully intact Garbage Gobblers in Ashcroft, Langford and Penticton. In fact, the Garbage Gobbler is so well loved and fondly remembered that he even has his own Facebook page! Do you have any Garbage Gobbler pictures or stories that you would like to share with us? Any nostalgic feelings? Or perhaps you are interested in learning more about transportation history in BC? Connect with us and let us know. They are back. Thank you. My Dad from England loved them when he visited. I’m an old Garbage Gobbler fan from the days when I came home on leave and my parents and I toured the interior (the brand new Fraser Canyon Highway). Cool! Thanks for sharing Rod – we haven’t heard about the Manitoba cans – they sound “out of this world”! There is a garbage gobbler at the entrance to the Rock Creek Fairgrounds. ( I’ll get a photo next time I’m there.) It’s still used as a garbage can for the Fair. We’d LOVE to see it Corinne – thanks! Greetings from Calgary. The Garbage Gobbler shots are classic trip down memory lane. 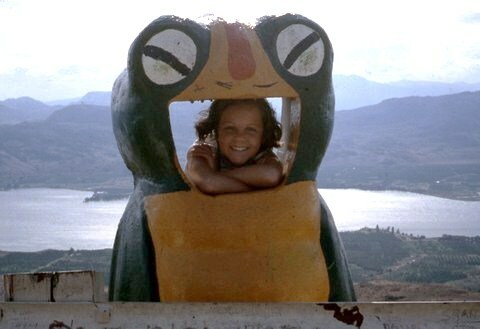 But any chance of seeing a return of these lovable “HIP” creatures along BC highways Rest Stops and picnic areas? I thought they were a “NEAT O” “CRAZY” masterpiece. It gave kids of the 50’s 60’s and 70’s something “OUT OF SIGHT” and get “CRANKED” over seeing on those long drives. L O L. My favorite GOBBLER Anarchist Pass Ossoyoos HWY 3 View point turn out. Thanks for your “JAZZED” response to our Garbage Gobbler blog. You will be happy to learn that a new breed of Gobbler has recently returned to BC Highway Rest Areas across the province. Hope you like them! I believe there is a garbage gobbler still in Williams Lake BC, he is stored up behind a locked compound heading north along the highway just as you are headed up the hill. HMC, maintenance contractor for service are 18, has a restored gobbler at their McLeese Lake location. Very cool Ed. We will have to track down a picture to share!